According to the experts at the World Waterfall Database, an organization dedicated to accurate measurements of waterfalls across the globe, Multnomah Falls actually ranks 154th tallest in the United States. You can monkey with the numbers a bit to raise its standing, but it still won't come close to elevating the falls' supposed superiority. If you eliminate waterfalls in Hawaii and Alaska – limiting the list to falls in the lower 48 states – Multnomah Falls only rises to 108th tallest. Take out waterfalls with unconfirmed heights in the database and it jumps up to 70th tallest. But what about that claim that it's the second tallest year-round waterfall – as in, constantly flowing regardless of the season? Does that have any merit? Bryan Swan, founder of the World Waterfall Database, is adamant on this point. "It's not true in the slightest," he said via email. "If we discount all of those 153 other waterfalls that we know for (almost) certain are taller than Multnomah that we [also] know to be seasonal, there are still dozens upon dozens that outrank it." The information shatters a piece of Multnomah Falls' reputation, but still leaves a question: Where did this whopper of a claim come from? Swan thinks that the claim might have originated in an old marketing campaign that stretched the truth to draw tourists to the Columbia River Gorge. It sounds plausible, but the truth might be a lot less bombastic. No authority could say for certain, but it looks like the "second highest waterfall" claim is a variant of the old "second highest year-round waterfall" line. As if in a game of telephone, the superlative probably morphed and dropped the "year-round" qualifier. The most recent Friends of Multnomah Falls newsletter actually sought to debunk that original claim, not by downgrading the waterfall, but by upgrading its status, claiming that the waterfall is in fact the highest year-round falls in the country. The source for that information? The World Almanac. 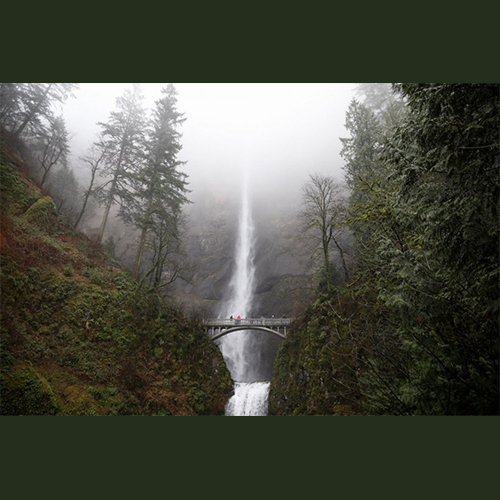 The almanac "has always had Multnomah listed as the highest falls in the United States without an asterisk – with the asterisk denoting 'diminishes greatly seasonally,'" Charlie White, a board member of the organization, wrote in the newsletter. "So we are absolutely accurate if we say 'Multnomah Falls is the highest year-round falls in the United States.'" But there's a problem. World Almanac editor Sarah Janssen said the book has never actually ranked waterfalls, instead listing "Notable Waterfalls" or "Famous Waterfalls." That asterisk does indicate seasonal flow, but, she insisted, the list of waterfalls is by no means comprehensive. White, in a phone interview, said he does understand that about the almanac. He uses it alongside other waterfall lists, but he says all of them have backed up his claim. He wasn't aware of the World Waterfall Database figures, but said he'd be open to change. "Our sign says 'information,' not 'correct information,'" he joked. "I'm happy to correct anything." Curiously, the 2016 version of the World Almanac includes an inaccuracy of its own, listing the height of Multnomah Falls at a whopping 850 feet tall. The U.S. Forest Service lists its height at 620 feet, while the World Waterfall Database measures it at 635 feet. A 400-ton boulder dislodged from the cliff face in 1995, but even if it affected the height of the waterfall, it still wouldn't have accounted for a 230-foot difference – it was about 40 feet long by 20 feet high, according to Friends of Multnomah Falls. Janssen said she wasn't sure where the 850-foot figure came from, but assured it will be corrected in future editions to the 620-foot figure from the forest service, unless the waterfall database's measurements are deemed accurate. So Multnomah Falls isn't the second-tallest waterfall in the United States. So what? Height isn't the only quality that makes a waterfall great, and Multnomah Falls is absolutely stunning no matter how you measure it. The folks at the World Waterfall Database agree. They use a complex rating system that takes height, magnitude, visibility, and more into consideration, comparing each waterfall against all others in the world. By that scale, Multnomah Falls ranks roughly 14th in the United States, in company with the likes of Niagara and Yosemite Falls.